In memory of Agnes CAMPBELL born 6th March 1807, died 20th April 1869. John MCMILLAN her son born 15th May 1834, died 21st March 1850. Joan MCMILLAN born 25th Feb. 1880 died 30th Sept. 1879. James MCMILLAN born 6th June 1839 died 30th August 1880. Robert MCMILLAN (husband of the above Agnes CAMPBELL) born 12th August 1797 died 11th Dec. 1886. His son William, born 31st Dec, 1831 died Workington 6th Feb., 1901. His daughter Agnes born 23rd Oct., 1836 died 28th Jan. 1912. Also his daughter Jane CAMPBELL born 9th Nov. 1841 died 10th July 1933. 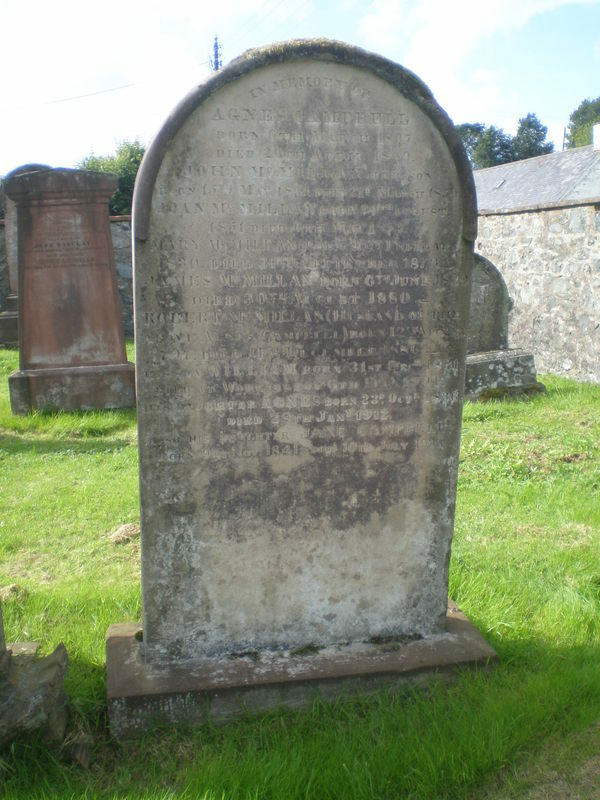 GC, “Kirkyard gravestone 7,” Carsphairn Archive, accessed April 20, 2019, http://carsphairn.org/CarsphairnArchive/items/show/113.